NewRAD has a long history of innovation in software, and we are excited to present our new and current offering. The NewRAD CNC Software Suite contains the following 3 CNC softwares that work together seamlessly for maximum speed and ease of use. 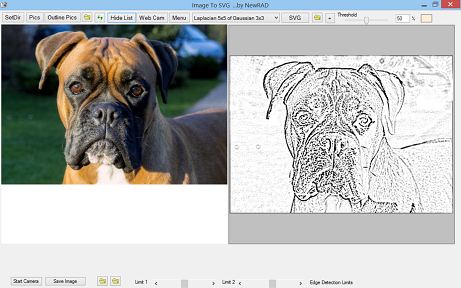 Image To SVG lets you convert an image, from a file or live webcam, to an outline drawing, to an SVG file. GCode Draw is a powerful 2D draw program with an integrated "2 1/2D" GCode Generator. 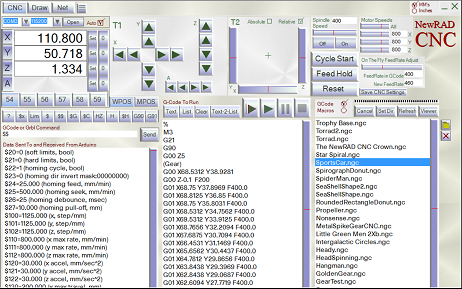 NewRAD CNC is a full-featured CNC Controller for GRBL. The NewRAD CNC Software Suite makes for a complete solution to a typical 2D CNC hobby user's needs. It is perfect for those use their CNC machine primarily for 2D operations such as drawing, engraving, laser cutting, plasma cutting, etc. For those that work in 3D space and have other software to generate their 3D GCode, there is still the NewRAD CNC controller which can of course run 3D GCode, and has a lot of luxurious features, is very easy to use, and is a great value in terms of price/performance. 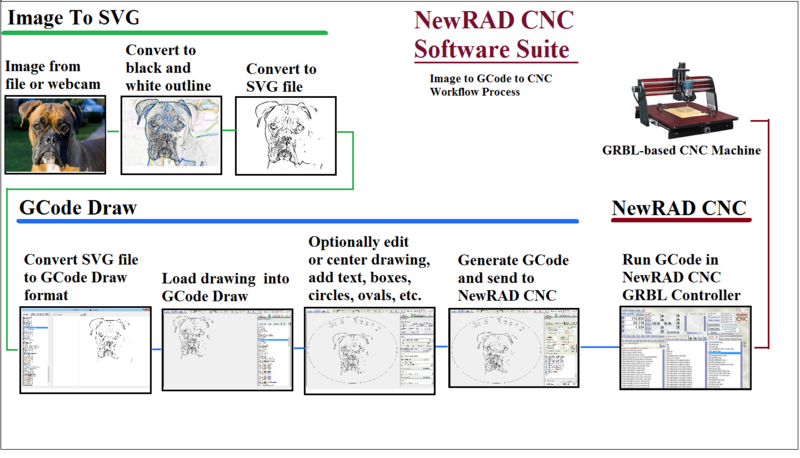 NewRAD CNC and GCode Draw are two extensive softwares integrated into one NewRADCNC.exe file. This integration allows for rapid fire CNC fun for a typical hobby user working in a 2D design space. All 3 softwares use the same data locations which makes for a very organized way of working which is very important because the entire CNC process of going from an image file to an outline image file, to an SVG file, to a GCode Draw drawing file with accompanying picture file thereof, to a generated GCode file, ...it is a lot of files and folders to keep track of, and this software suite keeps all of that data perfectly organized in subdirectories in your Window's "C:\Program Data x86\NewRADCNC" directory. There is no having to retype the file name over and over when saving your files, nor do you ever have to leave the screen you are working on to access the files you need. All of these things combined give you a lot more speed and is a lot less work than a collection of non-integrated softwares throwing files everywhere, and softwares that are simply not designed for speed, especially when accessing files. The speed gained allows you to fly through your work, and get the job running quickly. A typical user might start with a photo, convert it to an SVG file using Image To SVG, and then using GCode Draw, convert the SVG file to a GCode Draw format file and edit it by centering the image, adding text, graphics, etc. The user would then save the drawing, generate GCode from it, and then send that GCode to the NewRAD CNC controller to run on their GRBL-based CNC machine. It is quite a few steps and normally would be a lot of work, but it is all reduced to child's play with these 3 softwares working together seamlessly. The following graphic shows the 8 steps that could easily be done in about one minute, from photo to design, to running GCode on your CNC. This shows off the beauty of the integration between NewRAD CNC and GCode Draw, the standardized data location across applications, and the one-click philosophy of the user interface. This is the magic of the software. Speed is what you need and the NewRAD CNC Software Suite delivers. Image To SVG lets you convert an image, from a file or live webcam, to an outline drawing, and then to an SVG file with just one click. 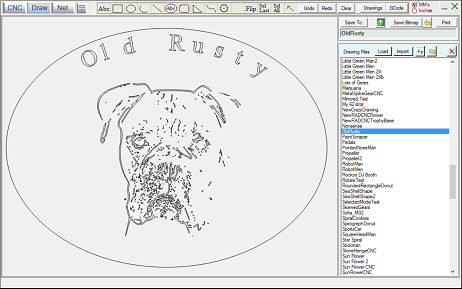 The SVG files created can then be imported into NewRAD's GCode Draw software, and from there you can edit the drawings, center it in frame, add text and graphics and then generate GCode from the drawing. Then you can send that GCode to the NewRAD CNC controller with just one click, and then run it. For more information, visit the Image To SVG page. GCode Draw is a powerful 2D draw program with an integrated "2 1/2D" GCode Generator. It is intuitive so you can begin using it immediately, with no learning curve, except with advanced features. It is designed specifically for CNC usage, and includes draw features targeted for typical CNC applications, like an oval with curved text object, and flipping or rotating groups of objects which can be fantastic when creating designs. Use the mouse and keyboard to change rotation parameters of selected rotated objects to move and rotate all the objects at the same time until you "get it just right". This allows you to create amazing designs in a very fun, fast, and easy way. You can take SVG files created from images using Image To SVG and import them into GCode Draw and edit them, centering the image, adding text, graphics, etc. ...and then save your creation and generate GCode from it, and send it directly to the integrated NewRAD CNC controller. Super fast. Seamless and simple. GCode Draw comes with 163 built-in CNC-friendly fonts. For more information, visit the GCode Draw webpage to see all of its amazing features, and video. NewRAD CNC is a full featured, Windows-based, CNC Controller (GCode sender) specifically designed to work with GRBL, and tested successfully on the cheapest possible hardware, an Arduino Uno, and GRBL-Comaptible CNC Shield using RAMPS. It maintains rock-solid communication with GRBL running on an Arduino Uno. NewRAD CNC has a one-click philosophy and is a luxury to use, compared to most other CNC controllers. It includes 2 luxurious transports yielding 4 styles of motor control, augmented with the keyboard for finer or coarser motor jogging. It is 4-axis and includes all the features you would expect, all just one click away. Plus you can customize its look with one of the many included colorful custom screens or "skins". For more information, visit the NewRAD CNC webpage to see all of its features, and video.